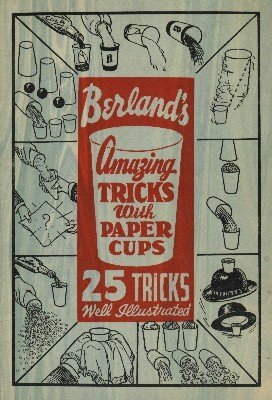 Although this booklet was written in the 40s, paper cups are still ubiquituous objects. Go to any fast food restaurant and you will find them, or at parties, at the company water cooler, picknicks, fairs a.s.o. This makes paper cups an ideal item for us magicians - great for an impromptu miracle. Sam Berland teaches 25 amazing tricks, from vanishing liquids to appearing silks in cups. Almost any magical effect can be achieved. You too should know at least one trick with a paper cup for the next discussion at the water cooler. 1st edition 1942; 26 pages. Multiplying Sugar and Hot Coffee.